Photos copyright of Brian Johnson, taken in 1973. Most of the photos are of the Comms Centre, with two probably being of Studio B Vision and Studio B Sound. The Communications Centre was situated immediately above the Foyer with large windows facing on to Pebble Mill Road. 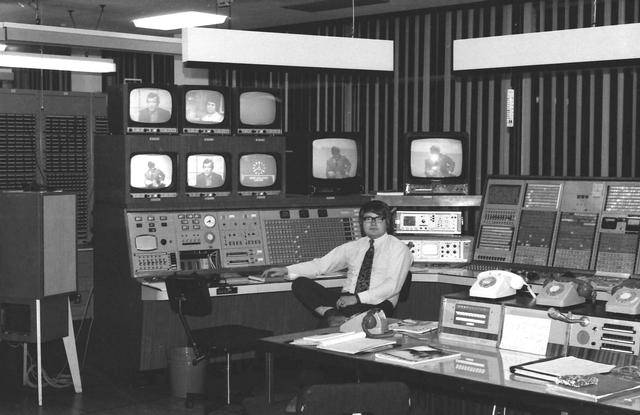 In brief it was the technical hub of the building and the liaison point with British Telecom, responsible for routing all the internal vision and sound circuits between the Studios, VTR, Telecine and the various external TV and Radio Networks. BBC 1 and BBC 2 passed through the Communications Centre from London and were routed to our own regional transmitters and one to Manchester for further distribution northwards. It was also a reception point for Radio and Television Outside Broadcasts via our own Radio Links or B.T. and for incoming contribution circuits from the North and East that were either required in Birmingham or routed through to Bristol or London.